A few weeks ago, it would have been unthinkable to suggest that the Charlotte Hornets might be a better team next season than the Indiana Pacers. But they had nearly identical records and point differentials over the final 50 games of last season, and the Bobcats were better by a mile after February 1 — a span of nearly 40 games. And now Charlotte has landed the double blow of signing Lance Stephenson, instantly their most talented two-way wing player, and snatching away the Pacers’ best (only?) off-the-dribble threat. Charlotte is now a real candidate to finish among the top four seeds in an Eastern Conference where things could get very interesting, depending on Derrick Rose’s recovery and the progression of several young players around LeBron James in Cleveland. The Cavaliers and Bulls should be the class of the East, but they both face major questions, and the conference below them is a jumble of 10 teams scrapping for playoff position. The Pacers kicked off free agency by offering Lance Stephenson a five-year, $44 million contract that he promptly rejected. It’s unclear if that offer remained viable Wednesday, when Stephenson signed a three-year, $27 million deal to play on one of the league’s sweetest floors in Charlotte. The Hornets deal will pay Stephenson about $3 million more over its first two seasons than Indy’s initial offer would have, and the shorter length will allow Stephenson to enter free agency again in the early stages of his prime — when the cap should be much higher. Indy’s actions since that first offer did not suggest the team was all that interested in re-signing Stephenson. It quickly committed about $7 million for next season to C.J. Miles, Damjan Rudez (IDEMO HRVATSKA! ), Lavoy Allen, and Shayne Whittington, leaving the Pacers almost exactly $3 million below the tax line — a wall that Larry Bird has repeatedly said the Pacers shall not pass. That $3 million would obviously not have been enough for Born Ready. Indiana could still have cleared out room to sign Stephenson under the terms of its original offer, but doing so would have required at least two of three likely cost-cutting moves: waiving Luis Scola, salary-dumping Ian Mahinmi, and using the stretch provision on Chris Copeland (and Chris Copeland’s hair). All that might not even have been enough to bring back Stephenson and duck the tax, since Indiana would have needed quality backups to replace the departed. The Pacers have replaced Stephenson mostly with shooting. It seems like Miles has been in the league forever, but he just turned 27, and he has morphed over the last two seasons into a long-range gunner capable of sniffing 40 percent from deep on a ton of attempts. Miles is the only player in the league to have logged 800-plus minutes in each of the last two seasons and jacked at least 7.5 triples per 36 minutes. Dude is not shy, though he is streaky, and he doesn’t bring consistent plus defense or much off-the-dribble creativity. Rudez is a sharpshooting Croatian power forward who supposedly reads Grantland, so he’s instantly my favorite player in the league. Shooting is nice, but open shots don’t just magically emerge. You have to create them, and it’s unclear how the Pacers will do that without Stephenson. George Hill is a pricey caretaker point guard who often moved out of the way while Stephenson and Paul George ran the show. Paul George has grown as a pick-and-roll guy, but the improvement has been slow and fitful, with lots of shaky ballhandling and missed pull-up jumpers. The Pacers fancy themselves an inside-out team, but opponents aren’t going to send panicked double-teams at Roy Hibbert and David West post-ups just because of the names on the back of the jerseys. Hibbert just wrapped perhaps the most bizarre individual season in recent league history, and West is 33, coming off a season in which he took on a smaller offensive role until stepping up massively in several key playoff games. He can still unleash those fearsome shoulder blocks, but he can’t do it every night, or against every one-on-one matchup. Remember: Indiana had the league’s worst non-Philly offense after February 1. Only three teams attempted fewer shots in the restricted area for the full season, per NBA.com. The Pacers turned the ball over at an ugly rate (and very often in comically ugly fashion), their offensive rebounding crashed, and they got to the line at only a league-average rate. They were just miserable to watch. Stephenson contributed to some of those issues. He loves fancy passes and show-off-y dribble moves that go nowhere, and all those shenanigans made him among the most turnover-prone players in the league on the pick-and-roll and in transition, per Synergy Sports. But he was also viciously effective at getting to the rim on the pick-and-roll, a skill that approximately zero other Indiana players bring to the table. He expanded his repertoire of off-the-bounce moves and gradually showed a sophisticated understanding of how to attack different styles of defense. He’s a smart passer, probably the best among Indiana players, though he’s still learning how to make the right pass in traffic as he barrels toward the rim like a running back. He stood as Indiana’s only game-to-game jolt of creativity. They ran more with Stephenson on the court. They generated more shots within the restricted area, and though the Pacers shot fewer 3s with Stephenson playing, they nailed those shots at a much higher rate — especially from the corners. Indy shot 45.5 percent on corner 3s with Stephenson on the floor, and just 33.6 percent when he sat, per NBA.com. Corner 3s work only when someone creates them by penetrating the defense and drawing help. Indiana overall scored 102.9 points per 100 possessions with Stephenson on the floor, and a dreadful 98.3 when he sat. George’s split was similar, but George’s field goal percentage cratered from 44.4 percent with Stephenson alongside him to 38.6 percent when Stephenson left to go chat with Larry Legend. All five Indiana starters have dramatic on-court/off-court splits. No team was more dependent on its starting lineup, which logged more minutes over the last two seasons than any other five-man group in the league. There is real value to continuity — to starting the season with years of shared knowledge of a defensive scheme and teammate tendencies. The Pacers went into last season with a giant head start. That advantage shrinks without the team’s most dynamic player. It’s tempting to suggest the Pacers could replicate Stephenson’s bully game by inserting Rodney Stuckey, signed to a tidy one-year minimum deal on Wednesday, into Stephenson’s starting spot. Stuckey is another hybrid guard with mean intentions off the bounce and a useful post-up game from the left block. But he can’t shoot, and it will be hard for Indiana’s offense to function if George and Hill are the only 3-point shooters on the floor. Stuckey’s driving game can get a little wild and self-centered, veering into pull-up 17-footers when other guys are open, and his post game is really only a plus weapon in mismatches. Starting Miles is an option, and the Pacers’ four-year, $18 million deal for him is a big bet on his becoming a more well-rounded player. He’d certainly provide more spacing for the starters, and the Pacers could slot Stuckey in as co-point guard with C.J. Watson on second units — a role that Stephenson played last season. But starting Miles would place an enormous burden on George to create damn near everything from the perimeter, and as great a two-way player as George is at his peak, he hasn’t proven up to that kind of responsibility. Scoring will be a major challenge for Frank Vogel and his staff. Vogel has done well in Indiana, but the team’s offense has stagnated as the defense developed into a juggernaut. The defense should remain stout next season, though Miles and Stuckey mark a step down from Stephenson on that end. Stuckey can’t slide over to small forwards like Stephenson can, and Miles, though rangy, has occasional lapses in alertness that have frustrated prior coaches. George is going to be exhausted by the end of next season. Still: The system will work as long as George and Hibbert are around. 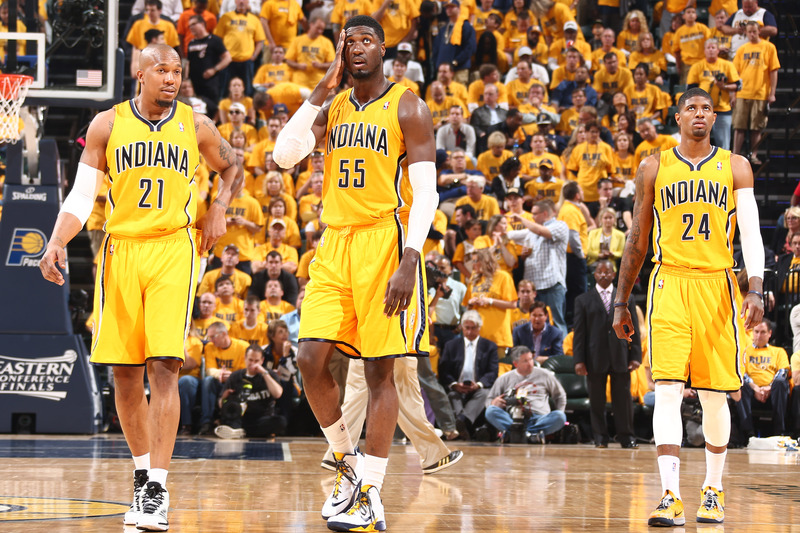 Indy was a borderline top-five defense even as the team fell apart after the All-Star break. Joke about Hibbert’s bricky shooting and lack of rebounding, but recognize he was still scaring the crap out of John Wall and Bradley Beal in the conference semifinals. The offense needs more care. Really, it needs a total revamp, a task that gets harder without Stephenson. Vogel has to make better use of his bench, including the duo of stretch power forwards he now has in Copeland and Rudez. There just needs to be more continuity — more movement, more cohesion, no more dudes mucking up the team’s spacing by standing in random spots inside the 3-point line. A one-way team can get only so far. The Pacers stand as the best current evidence of that. A one-way team can earn a top-four seed in the East, but that’s no longer guaranteed for Indiana. This may be the first step toward a larger overhaul of the roster. Hibbert and West can both be free agents after next season, and Hill hasn’t lived up to a five-year, $40 million contract. Almost every front-office move that Indiana made over the past year has backfired — trading for Evan Turner, signing Andrew Bynum, and coughing up three valuable assets (Miles Plumlee, Gerald Green, and a first-round pick) for Scola. Exchanging Stephenson for a few players might be a needed roster tweak for a 56-win conference finalist with chemistry issues. It might also be a hint of larger things to come. Those chemistry issues are now Charlotte’s problem. But this is exactly the kind of bet a small-market team with no history of drawing A-level free agents has to make. Stephenson is just 23, he plays both ends, and he’s going to get better. He fills a glaring need for another dose of off-the-dribble creation — a guy to ease the pressure on Kemba Walker and to run secondary offense when Professor Al Jefferson, PhD, kicks the ball from the post. Stephenson is a better long-range shooter than Gerald Henderson, though he needs to shoot more often instead of catching, holding, and planning his next fancy move while the defense resets. He can play alongside either Henderson or Michael Kidd-Gilchrist, and depending on how Steve Clifford staggers the rotation, Stephenson can run second units that fell apart when both Jefferson and Walker rested. Stephenson might have to check his offensive rebounding addiction when sharing the floor with Kidd-Gilchrist, since the Hornets under Clifford have been maniacally precise about getting back on defense; Kidd-Gilchrist was the only perimeter player with free reign to crash the boards last season, and having two wings chasing second chances can kill your transition defense. But Stephenson has played his entire career in a defensive system very similar to what Clifford runs. Charlotte is also betting on its strong locker room here. Several of last season’s Hornets called it the best locker room in which they had ever lived and played, and Marvin Williams, signed to replace Josh McRoberts, has become known as one of the league’s great character guys. Jefferson is a delight. Walker is a positive spirit, and Kidd-Gilchrist is a worker with a sly sense of humor. Henderson surely wants to shoot more, but he’s a good pro. This is still a gamble. Stephenson can over-dribble, hog rebounds, do stuff out of scheme, and act like a loon on the court. But the risk-reward calculus is good, especially considering that Charlotte was ready to pay Gordon Hayward twice what they’ll pay Stephenson. And Hayward is not a demonstrably better player. If things go badly, this is a two-year deal with a team option for Year 3 — a short contract that is easily tradable. It also leaves the Hornets with about $5 million in room before they sign Noah Vonleh, P.J. Hairston, and Brian Roberts, a nice backup point guard. They could use an extra big man after losing McRoberts. Williams bloomed into a stretch power forward in Utah last season, but he’s not the passer and screener McRoberts was as a crucial hub at the elbows. Cody Zeller is unproven, Bismack Biyombo has been a flop, and Vonleh is a rookie. Charlotte envisions Zeller playing some backup center minutes, so they could really use another power forward. This could really be a coup for Charlotte. The team could have north of $12 million in cap space again next summer should it renounce Henderson’s rights (assuming he opts out), and it’s nabbed one of the best free agents on the market — in terms of basketball talent, anyway — at a discount. The Hornets are a legitimately dangerous playoff team now. The East is going to be wild.